I have diffusion data and I would like to do distortion correction… but I do not have two phase encoding directions, fieldmap or T2. Has anyone tried using a T1 for distortion correction? I have read a few papers about this topic but I was wondering if anyone has managed to implement this successfully? I did that a long time ago (for restropective data) and after testing different method, we found the most effective was to non-linearly register the csf segmented map (with spm you segment the T1 and then the mean B0) then you compute the deformation (with ants or other) between those csf map. The advantage is that you have the same contrast. I had the same problem with my data, and what I did was rigid register the T1w to the B0, and after with ants non rigid register the B0 to the T1, restricting the registration with the -g option in ants. Finally apply the registration to all the volumes. It work for my data. A common problem, and we had it as well with a lot of older, yet very important, historical data. I designed an algorithm specifically for this purpose just this year actually (and thanks to lots of work from @rtabbara, and lots of experimentation, we got it implemented as well). Our solution is based on some work I did during last year (see this abstract), where I was able to simulate the T1w image contrast quite closely from 3-tissue CSD results; but our iterative EPI distortion correction has some other bells and whistles now as well, like iteratively refined outlier rejection, and simultaneous (iterative) correction for both EPI distortions along the phase encoding direction on the end of the diffusion data combined with rigid motion correction of diffusion vs T1w data. The latter point is actually quite important: you’re after a combined model of EPI distortion as well as motion to be able to correct both accurately. They both depend on one another. At the moment, this is just an internal prototype tuned for our own use cases (however, it did already run succesfully on a large cohort of 500+ subjects that often even have large lesions); but I’ll try and get something out at some point (the ISMRM deadline will be there surprisingly soon again any way; so that may just as well be a good opportunity). It’ll eventually make it into MRtrix3, but not any time (very) soon though, as I’ve got other priorities at the moment. If you think the other proposed solutions above wouldn’t cut it for your needs though, don’t hesitate to contact me privately: we can always arrange something if and when it makes sense. For visualisation purposes, the CSF component from the 3-tissue CSD is shown to represent the diffusion data, overlaid by the T1w image in red (hot colour scale). The after image has the distortions corrected on the diffusion data, and the relative rigid motion corrected on the T1w image. Quick question on this: doesn’t non-linearly deforming the DWI volumes affect the gradient directions (locally) ? Good question. No, that shouldn’t affect the DW gradient directions, since these gradients are massive compared to the background gradients that cause the distortions. The phase-encoding gradient on the other hand is much smaller, at least when using EPI. The net result is the DW signal itself is not particularly affected, but it is misplaced. Note that this is, maybe surprisingly at first sight, a reason that correction of these distortions is in a way extra important: these distortions don’t act like some sort of non-rigid motion on the images (i.e. 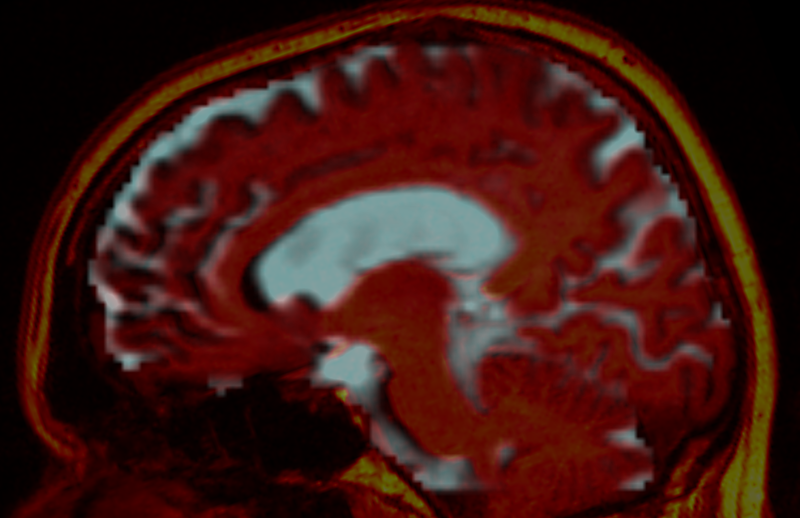 as if the real brain was squished and stretched a bit in places), but just misplace the image data (signal) without adjusting the orientations accordingly. That means that, in the absence of correction for the distortions, the orientations (in some particular places) don’t line up any more with the surrounding spatial information; so a bundle can (in a way) be broken a bit. This may lead e.g. tractography to slightly struggle a bit more to make it through such bundles, since the local orientational information (of the FOD) may lead streamlines to bump into edges of structures, rather than traversing through. The net result is the DW signal itself is not particularly affected, but it is misplaced. Just to slightly add to that wording (even though meant completely correctly): note that the “misplaced” here means misplacement of absolute amounts of signal. What I mean to clarify by this, is that when the distortions non-linearly shrink a certain local region of the image, the signal gets added up (i.e. more signals get placed into a single voxel, if that makes sense). So regions that get squished, will appear brighter than they should’ve been; and regions that get stretched, will appear darker than they should’ve been. When applying a correction like the above, the image intensities should be modulated accordingly (based on the local determinant of the Jacobian of the warp). Finally, with respect to those gradient directions again: if also correcting for rigid motion, that bit of the transformation, if applied to the diffusion data that is, should of course act on the gradient directions (since it’s genuine motion). However, since our approach over here (the one I illustrated above) acts on the FOD (and tissue) images directly, we would have to reorient the FODs. To avoid the computational cost and possible confusion related to that, I’ve designed that approach to correct the rigid motion “on the end of the T1”. It’s essentially all the same, since we’re only talking about relative motion between the 2 datasets (DWI and T1); but for some of our applications, it makes more sense to move the T1 rigidly around, rather than the DWI data. Since the T1w image is typically acquired first in most/all of our studies, we also see most motion happen “between the T1 and the rest of the acquisitions”, since subjects seem to move more (settle down more) initially. So correcting things like above, the T1 then often ends up being (magically) already much more aligned to the other acquisitions (e.g. a FLAIR or something) as well; which gives us more (and more robust) options to correct motion of those other acquisitions relative to all the rest. Since SS3T-CSD is not currently implemented in MrTrix, I went ahead and wrote a small variant of it that seems to work quite well in simulating T1 contrast from DWI. Using that alignment, I follow Distortion correction using T1 to compute a linear mapping between [WM GM CSF] probabilities and T1 intensities - using the FA map instead of the GM response. I was just wondering if there has been any progress in implementing non-linear registration to a T1 (or T1 and T2) in MRtrix or if there is a straightforward way to achieve this that you would recommend. Is there any reason to use the warp field to modulate the DWI after it’s been normalized to the T1 image? The modulation is used when normalizing gray matter segmentation so that the deformation shrinking (or dilation) is reflected to the intensity of gray matter (used after for vbm). Thanks. Just making sure my reasoning was correct on this. Ideally, one would modulate the FODs based on any non-linear transfomation. Hopefully the figures in the original AFD manuscript should demonstrate why this is the case. However this modulation can’t be applied to the diffusion MRI intensities directly.